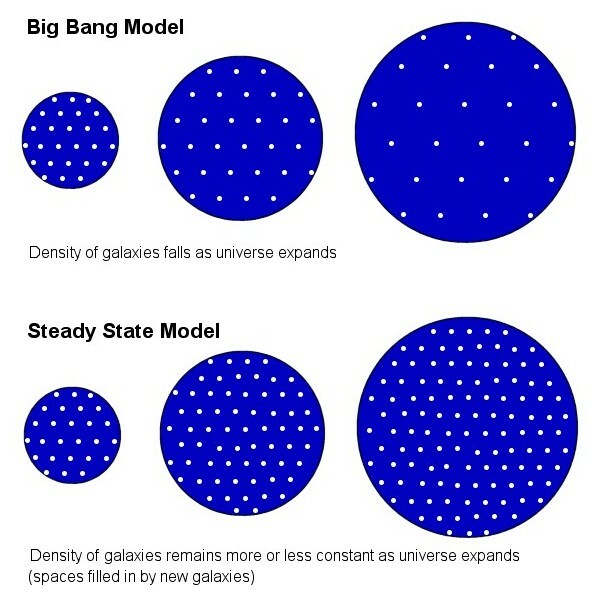 On reviewing these models, and even knowing that the CMB discovery favoured these as a prediction of the big bang theorists, particularly George Gamow, I personally favoured the Steady State Theory. The Steady State Theory really had only one model, which was an infinite universe that was eternal both into the past and into the future. It had no beginning and no ending. Comparison of the density of the universe as a function of time in the two competing theories. The Steady State Theory accepted an expanding universe, but that as it expanded hydrogen atoms were ‘created’ from the vacuum at a rate to just balance the decrease in density of matter caused by the expansion. The new matter forms new stars and galaxies and the universe remains in a steady state. The idea, promoted by such notables as Herman Bondi, Thomas Gold and Sir Fred Hoyle, needed no Creator because the universe had always been. It never had an origin. For a student like me, who wanted a simple answer to the question of the origin of the universe and to avoid the God question, the Steady State Theory was ‘it’. Why look elsewhere? At that time I was an atheist and I satisfied myself this way by writing God out of the equation. But the evidence of the Hubble expansion and the CMB radiation was rapidly changing the views of the scientific community. However, as the Big Bang Theory developed, its lead proponents in the 1950s (when Fred Hoyle coined the phrase in derision, being one of its most ardent opponents) were often called ‘evangelicals’. This could have been because they—Gamow, (Robert) Dicke, etc—were largely Americans, but not Ryle, an Englishman. But they were mostly atheists. When Pope Pius XII declared, at the opening meeting of the Pontifical Academy of Sciences, November 22, 1951, that the Big Bang Theory does not conflict with the Catholic concept of creation, he gave a big boost to its acceptance in the wider community. But those who opposed it did so largely on the grounds that it involved an origin in time. From 1965 on the Big Bang Theory rapidly gained ground over the Steady State Theory, and though most of its proponents have now died, there still remains a small devoted following. They follow a revived version, the Quasi-Steady State Creation theory. This was largely the creation of Fred Hoyle—even it needed a creator (Ha!). It incorporated a quasi-steady state universe with many cycles of expansion and contraction, but not with a big crunch into a singularity. We are apparently now in one of the expansion cycles, according to that theory, and the creation was not by a Creator, but a property of the universe itself. I remember a debate I watched in the 1980s with William Lane Craig (an evangelical Christian apologist, who started the Reasonable Faith apologetics ministry) and a prominent atheist. Craig used the argument that the universe had to have an origin in time because we observe an expanding universe and that was his proof that the biblical creation account was true. Essentially it is the Kalam cosmological argument, which argues that because the universe exists, and had a beginning, it had to have a cause to its existence, and God is invoked as the first cause, the uncreated first cause. That argument, in itself, is valid, but Craig used the Big Bang Theory to argue for the creation of the universe in a past moment of time. By basing his primary argument on the idea that the universe is expanding, Craig said that the standard Big Bang Theory of Friedmann and Lemaître, a solution of Einstein’s field equations applied to the universe with the assumption of the cosmological principle, meant that the universe arose out of a universal singularity. Do you see it? It illogically elevates man’s theories to facts, and then uses those so-called facts as evidence to prove the thesis. This is the argument. But cosmology is just not that simple. The universe is not a lab in which arbitrary tests can be carried out. Cosmology, in fact, is not really even science. It is more philosophy, a belief system, and it requires the adherents of any particular cosmogony to believe in their story. But here you have the Big Bang Theory used to ‘prove’ the creation account of Genesis in the Bible. The atheist followers of the Big Bang Theory really hate this aspect of its origin in time and have worked hard to overcome it. Now this brings me back to the main point of writing this. My main reason back in 1968 to believe in the Steady State Theory over the Big Bang Theory was because it didn’t need a beginning. Because of that I believed it didn’t need a Creator, and because if I believed it did need a Creator then I would have had to acknowledge Him. I believe many scientists who call themselves atheists believe the same. I was running away from God as fast as I could, and they are doing the same. Now the problem does not end there. I would still have had a problem if I believed in the big bang cosmogony after I became a Christian. I know this because I did believe in the Big Bang Theory by the time I became a believer in Jesus Christ. It was only after I read the Genesis account of the Creation and believed that the Scriptures were authoritative, that I became a biblical creationist. Nevertheless there are many Christians who believe in the William Lane Craig argument and use it. They believe the Big Bang Theory is a fair description of the creation of the universe. They also believe the first cause argument applies to the big bang out of the singularity, because it was an origin in time. Hugh Ross, with his Reasons to Believe ministry team, claims something similar, even states that the Bible literally describes the big bang origin and he accepts it as proven science. Ross puts this so-called science on the same par as the books of the Bible. It would seem to me, in fact, that he puts science before the Bible and uses it to re-interpret it, where it plainly says something else. However, recent theoretical work,5 published 4 February 2015, using a new quantum gravity theory, has an extra term in that theory so that in the early universe it eliminates the big-bang singularity and predicts an infinite age for the universe. According to the theory the big bang did not start with a singularity. It is no longer needed. And they can’t escape their desire to eliminate the Creator. Now what remains is some eternal quantum potential, a new ‘god of the gaps’. What is that, but a substitute for the eternal uncreated self-existing One, Who created the universe at the beginning of time about 6000 years ago? And what do those Christian apologists like Craig and Ross do to escape the dilemma, when the standard model turns away from an origin in time? Up until now, they have accepted the equations of the big bang theorists, like Friedmann and Lemaître. Do they accept it when the scientific community changes its cosmogony to an eternal big bang universe? What a quandary! Note: Lemaître’s universe did not originate in a singularity but he said it began in a ‘cosmic egg’, i.e. of finite dimensions. Fred Hoyle quoted by Smith, Q., in A Big Bang Cosmological Argument For God’s Nonexistence, Faith and Philosophy 9(2):217–237, April 1992. W .L. Craig, “God and the Initial Cosmological Singularity: A Reply to Quentin Smith.” Faith and Philosophy: 237–247. 1992. Stephen Hawking quoted in Did Alternative Worlds Exist at the Big Bang, http://www.dailygalaxy.com and PDF document “Hawking Rewrites History…Backwards “http://martin-olson.com/pdfs/Hawking%20on%20Universe%20Origin.pdf. Originally published in Hawking, S.W. & Hertog, T., Phys. Rev. D 73, 123527, 2006. A.F. Alia, and S. Das, Cosmology from quantum potential, Physics Letters B, 741: 276–279, 2015. For starters, eternal universe ideas, whether the Steady State Theory or the new ‘eternal big bang’ discussed in this article, all fall foul of the implications of the Second Law of Thermodynamics, which is thoroughly established by experiment; see World Winding Down. To say this I must make the implicit assumption that the same laws of physics apply when the pre-big-bang quantum potential supposedly eternally existed, and I also make the assumption, which might not be so obvious, that the Second Law actually applies to the universe as a whole. But Paul Davies said, “Yet the laws [of physics] that permit a Universe to create itself are even more impressive than a cosmic magician. 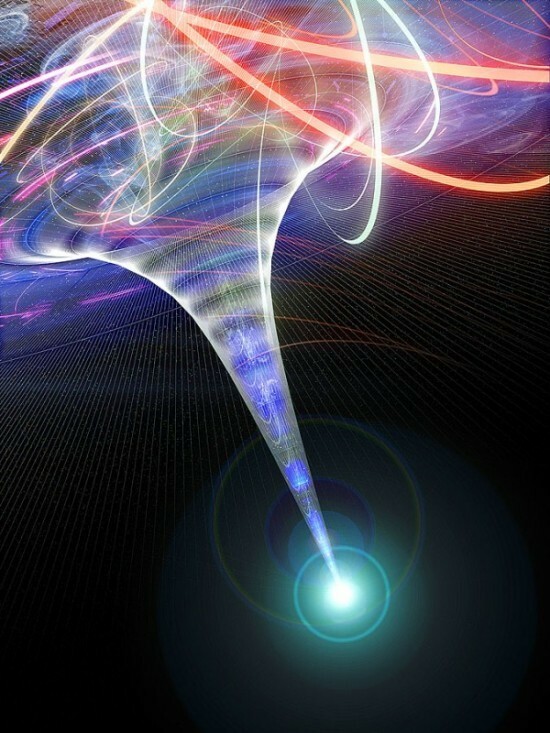 If there is a meaning or purpose beneath physical existence, then it is to those laws rather than to the big bang that we should direct our attention”; see The singularity—a ‘Dark’ beginning. Hence we can make that assumption, because it is consistent with that worldview. I would respond saying that it did not matter what the Pope’s intention was, the mere fact that the leader of such a massive body of adherents who follow his every word influences that culture. It was and is also used by the atheist community arguing along the lines of ‘if the Pope has no objection to the big bang why do you creationists object’ etc. They sort of view the Pope as ‘leader of all Christians’ as ill-informed as that is. Then they inject that science and faith can co-exist, as if to quickly slip in the concept that they are quite separate concepts. But rational faith sees the real world yet bases its interpretation on the Scriptures. So whether it is an official teaching of the Church or not it is irrelevant. That whole notion that science can exist or be pursued as a separate entity apart from metaphysical considerations is untrue. No observations can be understood or interpreted apart from some metaphysical underpinning–a worldview, if you like. There is clear difference of belief between what might be Catholic theology and what I would call straightforward Bible interpretation. By starting with the foundation presented in the Scriptures we can interpret the world around us, without reference to any ecclesiastical dictates from the so-called Church, the magisterium, its traditions and dogmas. However what has become the norm among most of those who profess to be Christian is that they consider science on some independent yet possibly equal footing with faith or religion. So with that worldview they believe absolute truth could be discovered in cosmogony apart from the biblical narrative. They then might use it to interpret the biblical account–forcing it to say what it clearly does not. I reject such a notion, because it involves starting assumptions that are essentially pagan in origin.